I wrote an "I Am Honoured' speech last night- quite lengthy and I briefly considered contacting a publisher- and then changed my mind. Ah, not quite. I jest, I josh, I joke. 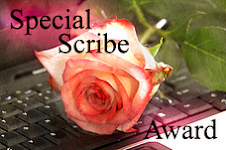 I was so pleasantly surprised, though, to find that I had received this 'Five Blogs That Make My Day' award. I am about to return the compliment and nominate some of my favourite bloggers for the same honour. I wish I could select more. 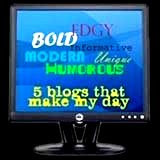 1) Write a post with links to 5 blogs that make me think and/or make my day. 2) Acknowledge the post of the award giver- thank you, Texican! 3) Tell the award winners that they have won by commenting on their blogs with the news. Beth's Stories: Beth tells stories to make you feel you have known her forever, her writing is inviting and she does not forget about her readers when she goes to Chile for a visit. Moments of Perfect Clarity: Julie travels, she shares her experiences in a captivating way, she is hilarious, she is a thinker and she now takes gorgeous pictures with her new camera. Mouse Medicine: we think of the same songs on the same day, she shares delicious recipes and she speaks the truth about what she sees in the world around her. Rhayne: Jaime writes thoughtful words, is so kind she hates to kill even spiders, and sees beauty in everything. Crows And Daisies: Polona stuns me all the time with her beautiful photography and a fleeting message to think about for the day. She makes one want to step outside and see what is out there. Stamper Dad: puts some life back into history, is conscientious and puts an enormous amount of work into researching information for our knowledge. There is always something new. Tango Baby: She comes from my beloved San Francisco and brings back wonderful memories of happy times. She is funny, and wise, and her blog is a daily excursion into the world of dancing and art. Oh, dear. Yes, I count seven. I broke the rules. I had to. I suppose that I had to stop somewhere but I simply could not do this easily. Congratulations to all- and to the other bloggers, just know how much I enjoy your daily or weekly writings. thank you so much for passing the award and bestowing this honor on the mouse and thank you for your most kind words. there are so many songs around us - I'm happy to hear that there are days when our heads are filled with the same tunes! "I'm happy to hear that there are days when our heads are filled with the same tunes!" The tune 'Our House' comes to mind as just one of them. I love Tangobaby, too, which makes me very excited to explore the other blogs you nominated. Yeah for you and your choices. I too am looking forward to visiting some of the other people that you have made such lovely comments about. I just want to mention..so you don't think I am being ungrateful (or a party pooper! )...I may not pass this on to 5 other deserving recipients, but I do intend to honour many wonderful people that I have met in the blogosphere in future posts. When you see this, please see it as my own personal way of giving back. Texican, thanks for coming by to see this- it was so hard to make the choices! It might have been easier to choose one than five, strange as that sounds. Relyn, it's nice to see you here. All the blogs I read are different in their own way, but connected by the good humour and sense of humanity that pervades all of them. That's why it was so hard to choose. Jaime, I'm glad it made your day too :) Your comments are always kind and thoughtful. And since I myself cheated and picked seven I think it's acceptable to do this however you want to- I wouldn't make anyone feel obligated, and your blog readers should know how much you enjoy them anyway! Everyone has their way of expressing that. So, no problem. wow, i am truly honoured by your choice, especially since we haven't known each other for long... thank you so much. Polona, don't feel you have to give awards to five people- accept it and know that I enjoy your blog, and as I said to Jaime, it's all up to the person in question what happens after that. Sometimes you don't have to be reading a blog for long for it to be a daily treat! thank you so much for the award and for your kind words. 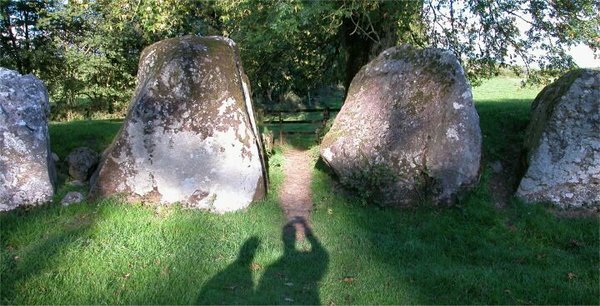 i've discovered lots of great blogs from reading yours. I am honored to be in your top five. Appreciate it. It was definitely deserved, I enjoy your blog very much. Thank you so much for the nomination! I am so honored to know that I make your day. I don't feel very wise...but I'm going to work on that. And I will follow all of the rules you've set forth with great pleasure!